Power loom weaver during the Industrial Revolution in Glasgow, Scotland. Janet was the eldest daughter in a family of four boys and three girls. Daughter of Robert Munro and Elizabeth Glasgow. Born in Glasgow, June 15, 1821,(1) her life, as those of her siblings would have been a difficult one. Glasgow was an overcrowded city at the time Janet and her family lived there. The large influx of poor from the country caused overcrowding and disease due to inadequate water and sewage management. Desperate families searching for work in the new “industrialized cities” found less than they hoped for in most cases living hand to mouth. The conditions in the factories were dismal and many of the workers would later suffer lung disease from breathing the toxic air. But it was work and brought food to the table that would otherwise lay bare. 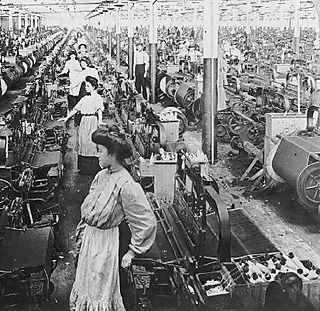 Children worked from a young age and Janet and her sisters worked in the Glasgow cotton industry as power loom weavers. Janet married Robert Stevenson June 6, 1841,(2) in Barony, Glasgow, Lanark, Scotland. Janet died February 03 1876,(3) in her fifty-fifth year when her youngest was just twelve years old. Her husband followed two years later. The cause of death was documented as organic disease of the brain. There are so many possible causes to this disease that they are too long to list here. Many of them relate to possibilities related to Janet’s difficult life. The fact that the death notice mentions the disease took only several days to take her suggests a possible stroke. However on the death registration from the Ontario Trust Cemeteries lists consumption as the cause of death. Janet Munro was buried at the Toronto Necropolis Cemetery Section 1 Lot # 154. I have gathered a fair amount of information on the Stevenson children and have decided to post them individually. Not yet online. I will notify when available. (1). B. Munro Janet "Scotland Births and Baptisms, 1564-1950," database, FamilySearch (https://familysearch.org/pal:/MM9.1.1/FM98-NHX : 2 January 2015), Elizabeth Glasgow in entry for Janet Munro, 15 Jun 1821; citing , GLASGOW, LANARK, SCOTLAND, reference , index based upon data collected by the Genealogical Society of Utah, Salt Lake City; FHL microfilm 102,917, 102,918, 1,042,938, 994,179. ​(3). D. 1876 Munro Janet Source Citation Archives of Ontario; Toronto, Ontario, Canada; Series: MS935; Reel: 14 Original data: Archives of Ontario. Registrations of Deaths, 1869-1938,1943-1945. MS 935, reels 1-615. Archives of Ontario, Toronto, Ontario, Canada. Archives of Ontario. Registrations of Ontario Overseas Deaths, 1939-1947. MS 944, reels 1-11. Archives of Ontario, Toronto, Ontario, Canada. Archives of Ontario. Division Registrar Vital Statistics Records, 1858-1930. MS 940, reels 5-10, 16, 21, 26-27. Archives of Ontario, Toronto, Ontario, Canada.